I have a confession to make: I am a snack addict. To put it simply, snacks are my life. I live eat and breath snacks. I mean, who needs proper meals when you can eat yogurt and apple rings and kale chips and cereal and popcorn and chocolate and GRANOLA BARS all day? Okay, I’m exaggerating a little bit. Of course I love full breakfasts and lunches and dinners, but to me the things I eat in between those meals are just as important. I have the kind of stomach that gets full very easily and hungry very fast, so I pretty much need to be eating small things all day. Hence the snack lovin’. 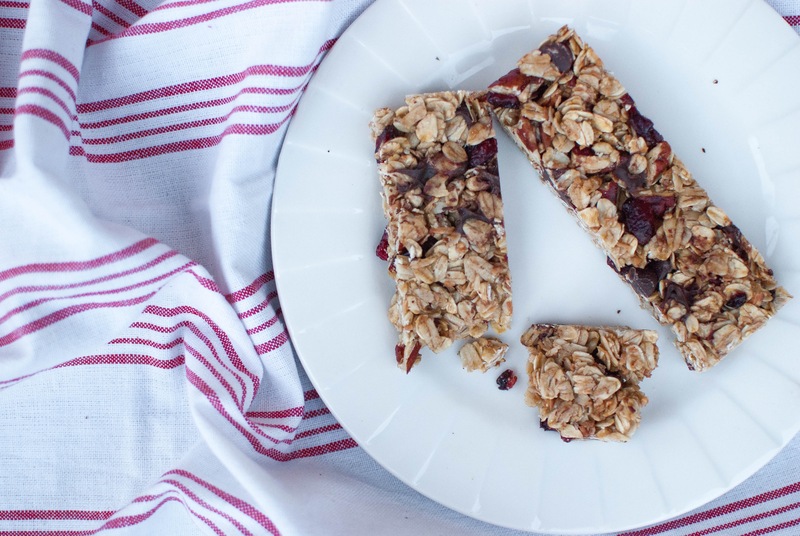 This is actually the second granola bar recipe I’ve posted… The first one was published more than a year ago (seems like yesterday, though!) and called for some oven time, resulting in bars that were much more on the crunchy, Nature-Valley-esque side of the spectrum. 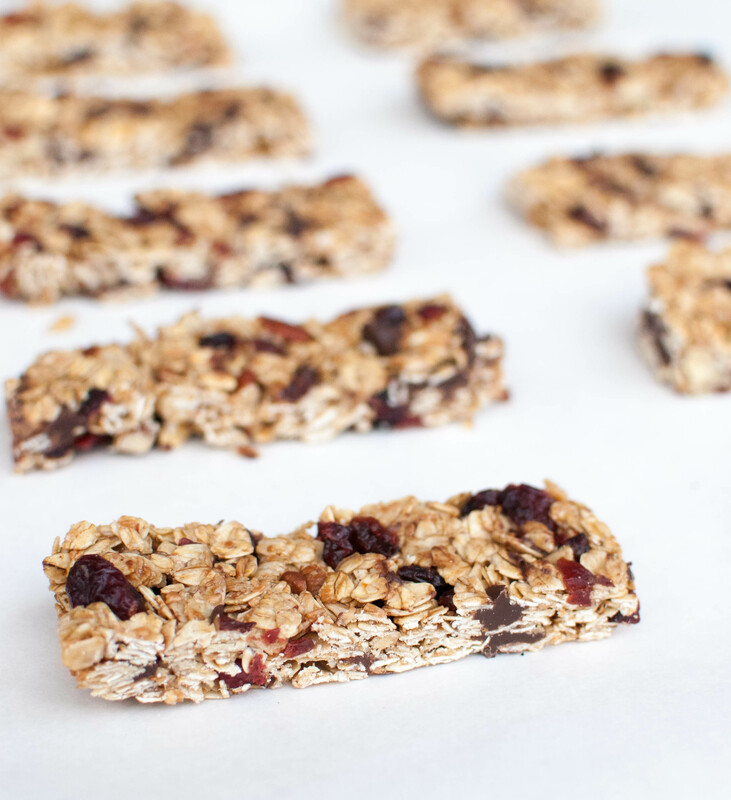 I’ve found that I actually prefer this chewy, no-bake (aside from toasting the oats), no-frills version, and the great thing about this recipe is that it’s really just a guide. So feel free to substitute things in and come up with your own favorite mix of add-ins! 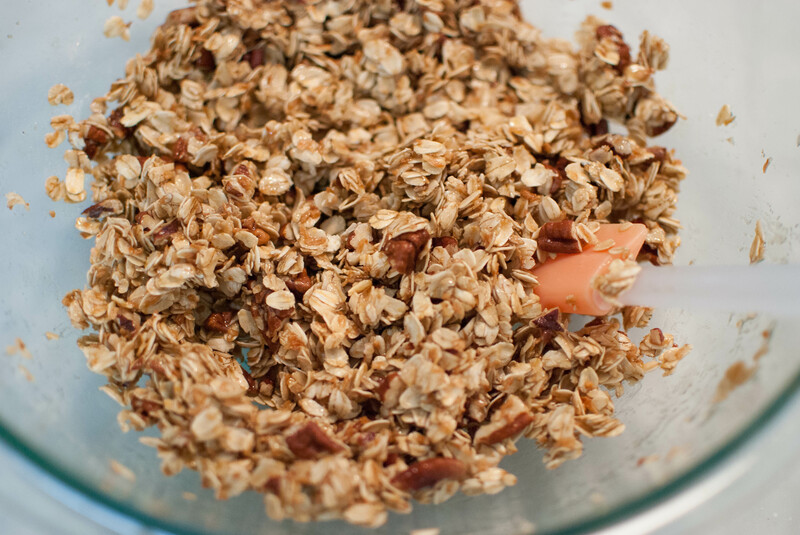 As long as you stick to the same basic ratios for the wet mixture and the oat mixture, you should be good to go. 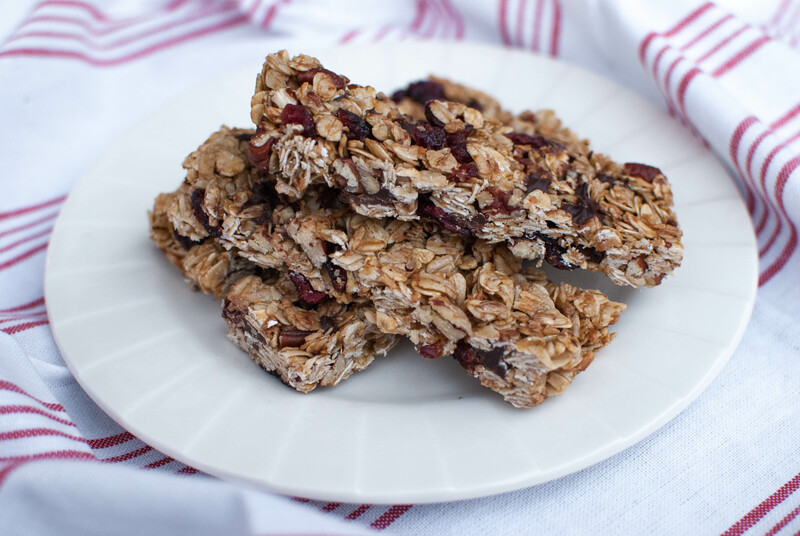 These are packed full of oats and nuts, made even better with coconut oil instead of butter. Make them for yourself or make them for your kids… They’re sure to please children and adults alike. 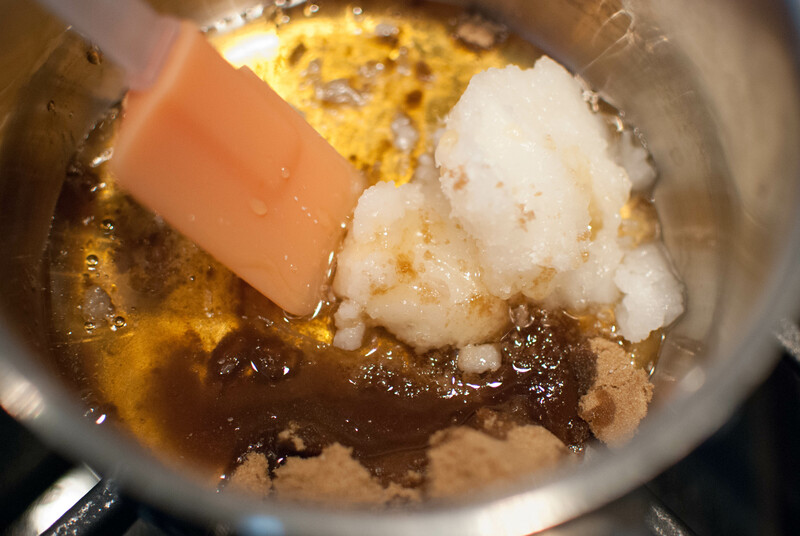 Let’s start on the stove: Combine some honey, coconut oil, brown sugar, salt and vanilla extract over medium heat and cook until everything is smooth and the sugar has dissolved. I let mine go a little too long but everything turned out just fine, so don’t worry if you’re forgetful like me! Meanwhile, toast your oats, nuts (I used pecans), and unsweetened shredded coconut (completely optional, but why say no to coconut) on a foil-lined baking sheet for ten minutes, or until everything is light golden brown. Throw all of that in a large bowl and drizzle on that glorious mixture from the stove. Your kitchen will smell amazing right about now, by the way. Toss it all together so that the syrup coats everything, then let the mixture cool for a few minutes… So that the chocolate you’re about to throw in doesn’t melt! I like dried cranberries in mine, too. Once everything is combined, go ahead and transfer to a foil-lined and lightly greased 8×8 or 9×9-inch square pan. 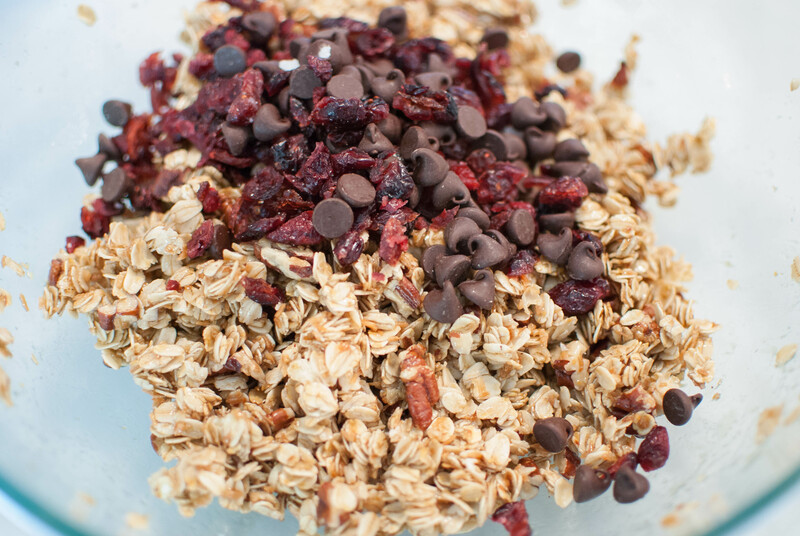 Now comes the crucial part: Make sure to use the back of a spoon or your fingers to press and pack the granola down as tight as possible so that your bars stay together! Once you’ve done that, just let the pan chill for a couple of hours… And cut into bars! I like to wrap mine individually in plastic wrap for easy grabbing. For firmer bars, keep ’em in the fridge, and for chewier bars, leave ’em on the counter. Or just eat them all now! There are so many directions you could go with these–maple pecan, cinnamon, vanilla almond… The list goes on and on! 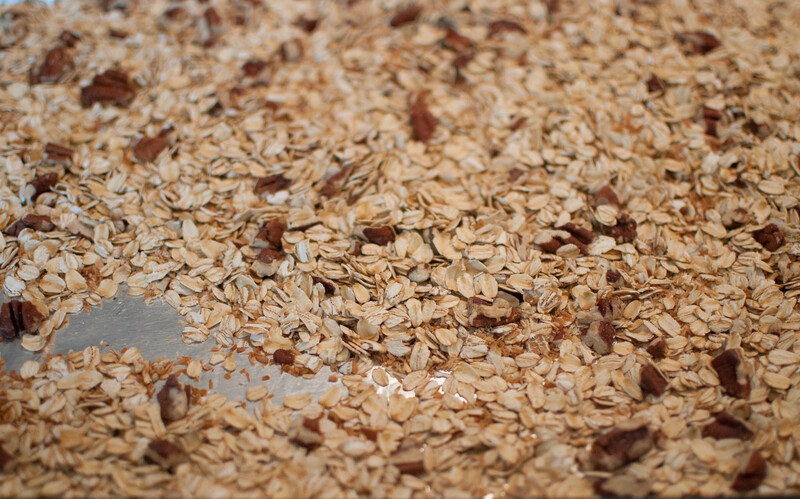 In a 350 F oven, bake oats, nuts and coconut on a foil-lined baking sheet until lightly toasted, about 8 minutes, stirring halfway through. Line an 8 or 9-inch square pan with foil and grease lightly. In a small saucepan, combine honey, coconut oil, brown sugar, salt and vanilla extract over medium heat and cook until everything is smooth and the sugar has dissolved. 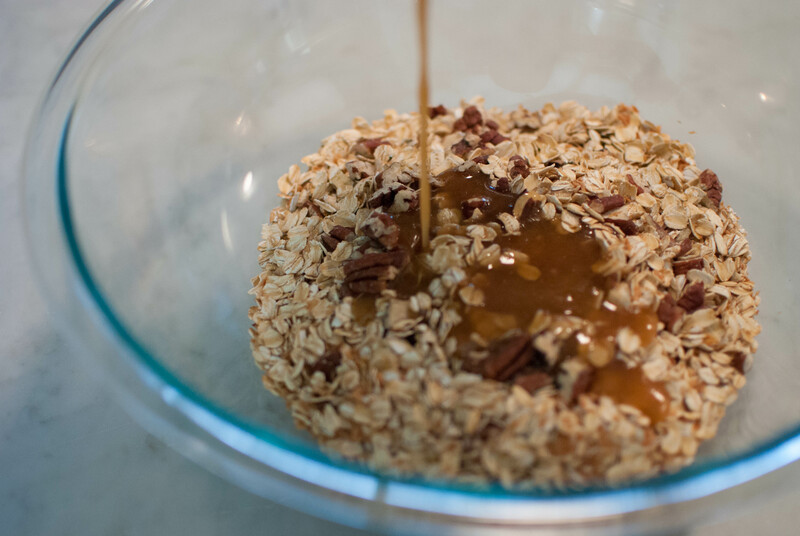 In a large bowl, combine the oat mixture with the syrup mixture. 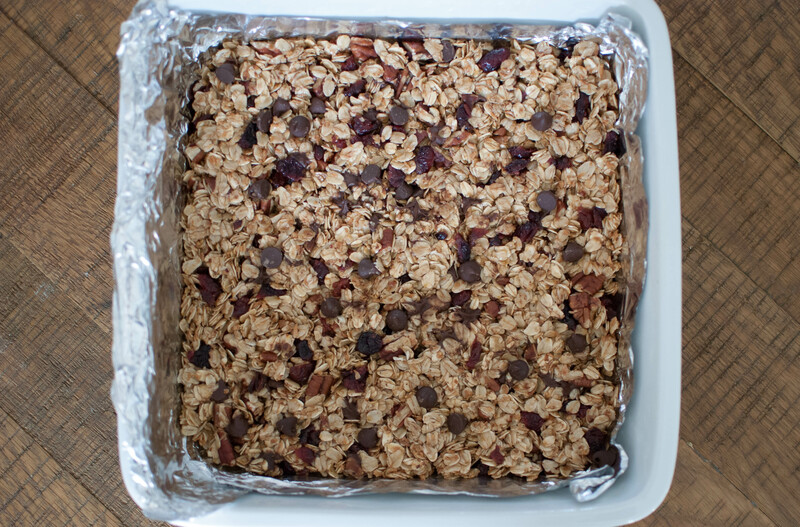 Set aside to cool for 5 minutes, then stir in dried fruit and chocolate chips. Press into the prepared pan, using the back of a spoon or your hands to pack tightly. Chill in refrigerator for at least 2 hours before cutting into bars. 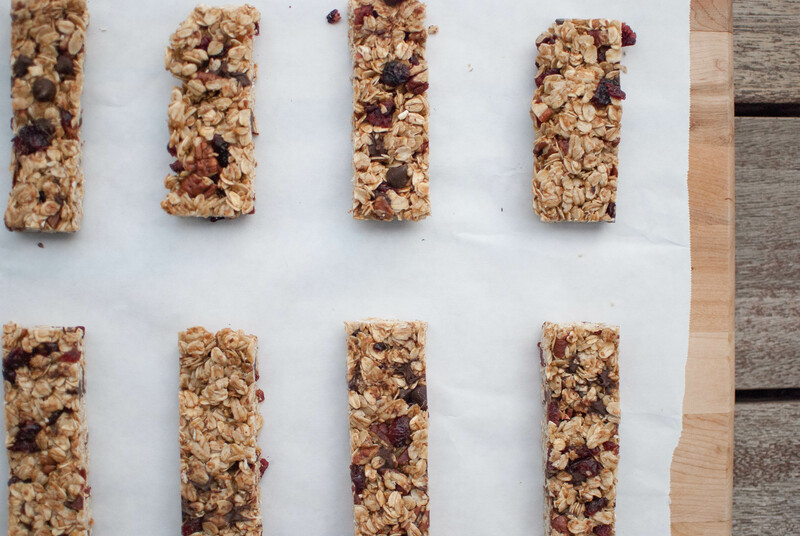 These are pretty simple to make, and make a really great snack!